Sweet shot! Love the focus like one of those character PoV shots in movies when the character is fixating on something! Really beautiful! I see you married with you LB - and in combination with a really great colortoning it works great again. Wow! Neon indeed. 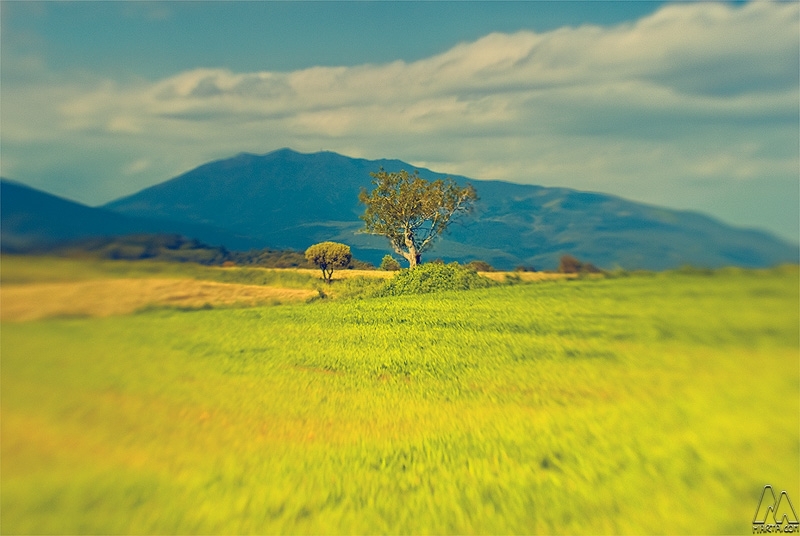 It's a very interesting effect with the edge distortion from the Lensbaby and the really saturated colours. It looks like a cross-process effect and it works very well. Marta, aquesta val per fer un anunci del Baix Montseny, quina preciositat, maquissima!! i els colors de somni!! Another inspiring distance shot with the Lensbaby. Beautiful scene. Amb aquest lensbabies es fan fotos curieses... I els colors preciosos!!!! This is a really, really gorgeous shot! very nice work marta. Great results with the lensbaby. Sí, quins colors més curiosos: les muntanyes blaves, l'herba elèctrica... txula! The color is absolutely surreal. Beautiful landscape!!! Catalunya?! That looks like field of the savanna! Stunning result, Marta, as usual. So beautiful. Soothing and gentle. Neon Field is right. I absolutely love the colors in this. I also like the shape and the composition. Really, really nice! Great colour tones! Beautiful landscape. The focus on that lensbaby is a killer. Make me want to invest in one but I have no money for that luxury yet. Wonderful image marta. Great use of the lensbaby (Muse?)! I like also the colors of this image. My goodness I love the lensbaby work. I need one of these and soon!!!! Great Lensbaby work! all the best!